We discussed this topic at the program in Manchester on the 8th May. First we had an introduction what Sahaja Yoga Meditation can do for us. Today the topic was about the right Energy Channel, the channel of our Actions. Last time we spoke about desires and how they create our emotions and actions. Basically everything that we do comes out of a desire, either from us or someone else. The stronger the desire, the more intense the actions and emotions. Let’s say I really really want a house with a swimming-pool. I will start thinking and planning a lot how to get enough money, take on a second and third job and work over-hours to make it happen. Or you are in work and your boss wants you to finish a presentation immediately. Again the planning, thinking and creating starts, this time to fulfill the desire of someone else. All these actions take the energy of the right Energy-Channel which you see in the chart below as a yellow line. Both, the left and right Energy-Channel which cater to our emotional and physical actions are represented by the sympathetic nervous-system. The sympathetic nervous-system is responsible for the homeostasis in our body, “to keep things going” and also for our fight-or-flight responses. It is the part of the nervous-system which “acts” and “reacts”. We are sad and tears come into our eyes, we are frightened and our breathing changes, we are angry and our blood-pressure goes up. So you see, that whatever happens in you, even if it is “just” thinking and feeling, a lot of physical processes are activated, too. To calm down all these actions we need the parasympathetic nervous-system, which is represented by the white line on the chart below, the Center Energy-Channel. The place where we find the inner peace and silence. Why Do We Need the Right Energy-Channel? In complete balance we manifest our compassion with our actions. If we are at this place where the left and right Energy-Channels meet, in the center, then all the qualities of both energy-channels are at our disposal. We are in complete control of our actions and emotions. The Right Energy-Channel, also called the Sun Channel, forms the Ego that allows you to relate to yourself as “me” or “I”. Without it you would not be able to differentiate between you and the others. Action and planning are the qualities of the right energy-channel but it grows into its full potential when the focus shifts from the “I” to the “You”. If we are overloaded with work, have to finish ten things at once and on top of it have responsibilities weighing down on us we exhaust the energy of our right energy-channel. At the same time, when we move into the right-side dimension of our being we move away from our emotions. At the beginning it may express itself in a way that we become more irritable, which later on may develop into aggression and anger if we do not come back into a balance. We become less and less empathetic. Unfortunately, you have likely encountered many stressed out, irritable and agitated people. This is because it can be difficult to maintain a balance of emotion and action when our workplaces and schools are stressful, aggressive environments. It can also be difficult to maintain a nurturing peaceful home where these imbalances can be corrected. As a result the negativity, stress and aggression continue to build. While we usually somehow manage not to cross a line, some people may reach a point where they go so far away from their emotional side that they no longer feel anything at all, even at the sight of someone suffering. Or worse, some may want to make others suffer. The worst expression of an extremely imbalanced right-side is violent behavior and homicidal tendencies. With the help of the nourishing power of the Divine (which is also the life-force, nature, your Higher Self, reflected as your Spirit… the name does not matter) it is very easy to come back into a balance. This is only possible with the help of the Inner Energy, the Kundalini, the motherly power within us that connects us with the Divine. 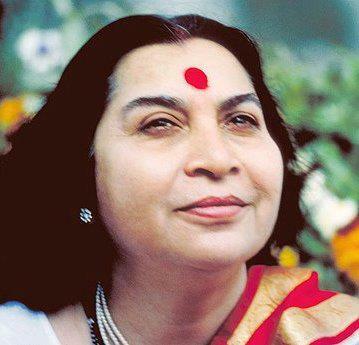 Here is a video clip where Shri Mataji guides through the meditation to awaken the Kundalini, the Inner Energy. As the name “Sun Channel” suggests the right energy-channel is creating heat in our body, therefore if it is too active we need to cool it down. For this you may combine following meditation and clearing techniques which are very helpful to cool down the right side, bring it back into a balance and to enjoy the sense of a deep inner peace and relaxation. Footsoaking: the video will show you how to do it. It will not only help your energy-system to relax but it also helps your body to detoxify. In nowadays society we are so bombarded with toxins from all sides that foot-soaking is something you should seriously start every day to support your body also on a physical level to throw out all toxins and toxic energies. Make sure you use the plastic tub only for your foot-soaks and nothing else. While we always rinse the tub after use there may still remain some of the toxins which were released. This treatment is best done in the evening so that you can rid yourself of all unwanted toxins and negative energies you absorbed during the day. Ice-pack: if you do not have enough time to do a foot-soak then an ice-pack helps to cool down your overactive right side. It really works wonders! On a personal note: I bought a very thin gel ice pack and on stressful days at work I tugged it under my shirt so nobody would see it. It truly helped a lot! Just make sure to never put it directly on the skin! Meditation! : While foot-soaking or having an ice-pack on your right abdominal area (never directly on the skin!) you can do the simple exercise of balancing your left and right energy-channels. Make sure that in all your meditations you keep focused on top of your head, the connection point to the Divine. Only then the Divine power can easily flow into your energy-system and help you to balance and nourish it. It is the same force, Mother Nature which nourishes and sustains plants, animals etc, basically everything alive. Introspection: As we have learned, all our actions are the results of a desire behind them. If you feel too stressed, irritated or exhausted look inside what is the desire behind the actions, behind the stress or exhaustion. Some desires may be worth to review but many others we may need for our survival. So sometimes it may help to change our outlook. I.e. Work is stressful because people are stressed around us and irritated. Instead of reacting and become irritated yourself you can try to bring in your compassion. In the balance our compassion unites with our actions. In this state whatever we do becomes effortless, we are “in the flow”. Your love is the greatest power you have. If you can look at irritated and stressed people around you with the new knowledge you have gained, understanding that their right energy-channel is simply overheated and you feel compassion for their situation, the same compassion will radiate out of you and have a direct effect on them. You yourself will feel more joyful because you enjoy your own love, your stress-level will smooth out and people around you will calm down.